Whether you call it sticky rice (糯米), sweet rice, or glutinous rice, this round-grained rice is immediately recognizable by its sticky, glue-like texture. 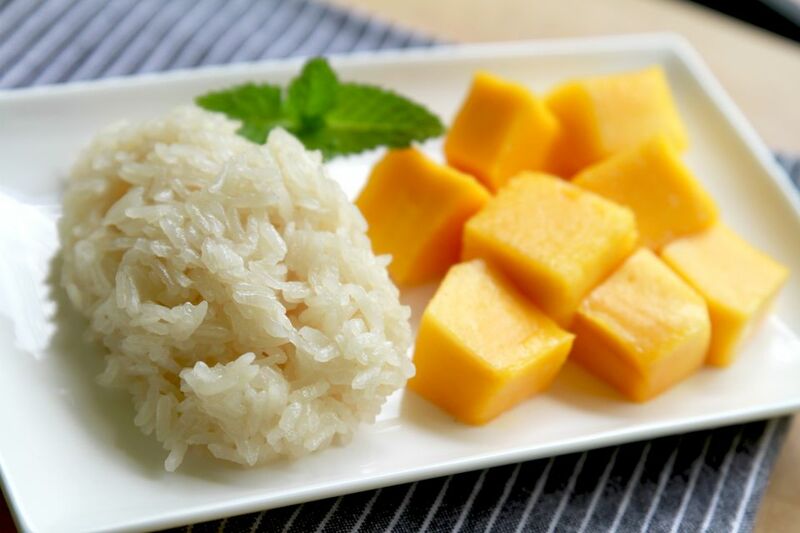 What makes sticky rice so sticky is the total or near absence of the starch amylose. Other types of rice contain both amylose and amylopectin; the stickiness of the rice depends on the proportion between the two. So, while a higher amylose content means you can count on a pot of standard long grain white rice to come out nice and fluffy, the lower amylose content in short grain white rice causes the grains to stick together. Long grain rice contains 19 to 23% amylose, compared to 12 to 19% for short grain rice. Glutinous rice (sticky rice), on the other hand, contains a maximum of 1% amylose, making it very sticky when cooked. Sticky rice is used throughout Asia. In Chinese cooking, sticky rice is used in both sweet and savory dishes, including desserts, as a stuffing in duck, and in dumplings such as Shumai and Zongzi. While most recipes call for steaming or boiling the sticky rice, it can also be stir-fried or you can cook it like Italian risotto. As noted, normally in Chinese cooking if you cook savory dishes with sticky rice then you will have to use long grain sticky rice and if you cook dessert dish with sticky rice then you will have to use short grain sticky rice. This is because the texture of long grain sticky rice (長糯米) is firmer and less sticky than short grain sticky rice so it tastes better if you cook savory dishes with it. But if you make desserts, for example, sweet rice cake or stuffed lotus root, then it will taste better if you use short grain sticky rice (圓糯米). In Chinese medicine and cooking, people believe black and purple glutinous rice/sticky rice is very good for your body and can improve your blood circulation. Depending on what kind of dish you want to cook or how you want to cook it, you might need to soak the sticky rice before cooking. You might find if you soak the sticky rice before cooking, it will turn too sticky and soft. As a general recommendation, when you cook anything for the first time follow the recipe and adjust the way you cook it to suit your personal preference. Before cooking, the high starch content makes glutinous rice grains chalk-like and opaque. There are also black and purple varieties of glutinous rice that are sold unmilled. Other names for glutinous rice include pearl rice, mochi rice, and waxy rice. Stuffed lotus root with sweet sticky rice - This stuffed lotus root is not too sweet and has a light lotus root fragrance. You can serve it both warm or cold with syrup. Pearl meatballs - Pearl meatballs are a classic Chinese banquet and party dish. While this is a meatball in the sense that it’s a ball of meat, it's covered with a layer of glutinous rice/sticky rice so it's given the more attractive name of “Pearl Meatball” (珍珠丸子). Lotus leaf wraps (lo mai gai) - This popular dim sum dish is made by steaming lotus leaves filled with sticky rice, Chinese sausages, and other vegetables. Peanut sticky rice - Just as congee is the traditional Chinese breakfast, in Vietnam it is common to start the day with a bowl of sticky rice. This recipe for peanut sticky rice consists of peanuts cooked with sweet glutinous rice and coconut milk. It includes alternate cooking directions for those who want to steam the rice.